Used Nuclear Medicine Equipment For Sale. Refurbished, Pre-Owned & Reconditioned Nuclear Medicine Equipment at Reasonable Prices. Used and Refurbished Radiology Equipment and X-Ray Equipment, Used and Refurbished Diagnostic Imaging Equipment, Used Cath Labs, Used C-Arms, Used MRI Systems, Used CT Scanners, Used PET Scanners, Used Nuclear Medicine Equipment, Used Mammography Equipment, Used Fluroscopy Equipment and Used Cardiology Equipment. 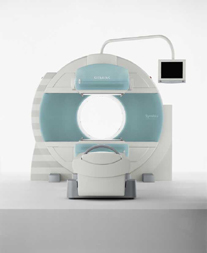 Description: A Merger of True Equals Symbia T, a True Point SPECTCT system, combines a dual-detector variable angle gamma camera with a CT scanner optimized for rapid, accurate attenuation correction of the nuclear data. Accurate attenuation map in less than 30 seconds of additional scan time. Accurate registration between anatomy and function improves lesion detection and localization. Increased diagnostic confidence by allowing physicians to review accurately registered SPECT and high quality CT anatomical images. Effective imaging of the new targeted tracers and agents. High-definition digital detectors. BiCORE collimators for general purpose and specialized applications. Ultrafast Ceramic (UFC) Detectors for the incredibly fast CT acquisition with the best possible dose utilization CT CARE Solutions designed to keep radiation exposure to a minimum without impairing scanner performance or image quality. e.media patient comfort and education system for interactive multimedia capability. syngo, Siemens' unique software platform that integrates patient related physiological and imaging data across your clinical workflow. Designed for SPECT and SPECTCT studies. Scalable platform lets you easily upgrade to Symbia T2 or Symbia T6.